The Icarus team is back for their toughest and most dangerous case yet when they take on a new and sophisticated organized crime syndicate that is determined to spread chaos around the globe. Murphy and Galveston have become too well known, a detriment in their line of work. They decide to move their detective business from San Diego to Nashville to start fresh, and it’s not long before they’re offered a new case, an easy case, and an easy payday–or so it seemed. Joseph Stanwick, a geology professor at Vanderbilt, has a problem. His life’s work researching the ice flows in Greenland has been jeopardized by the appearance of unknown gunmen. Stanwick wants to know why, and Galveston and Murphy are glad to help. But the quest to find out why the professor can’t continue his research quickly spirals out of control. Stanwick found something he wasn’t supposed to, and the gunmen want to make sure he doesn’t intefere again. What is happening on the ice? Is it just a company exploring for mineral deposits, or are they searching for something that was hidden in the ice years ago? The detectives are pulled further into the fray when they’re fingered for a murder back in the States. The only way out is to solve the case using their quick wits and unconventional tactics. Who has implicated them in a crime they didn’t commit, and what new, secret organization could be planning a terrorist attack on a nuclear scale? They can only rely on each other and their fellow Icarus Investigation crew members, because during Operation Snow Cone, no one else can be trusted. 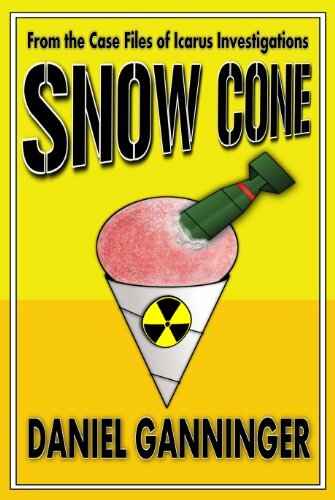 Snow Cone is the 1st book in the Red Hand mini-series along with Coconut Water and Stolen Dough. It is filled with non-stop action, adventure, fun, and humor – without profanity or graphic adult situations (but still plenty of mayhem) that will keep you at the edge of your seat. Each book can be read separately but more fun if read in order. So join the adventure and escape with the private eyes of Icarus Investigations. Daniel Ganninger lives with his wife and two children in Central Texas. He has a fascination for useless trivia, little known facts, and flying airplanes. He graduated from the University of Texas and the University of Texas Medical Branch in Galveston. When Daniel is not writing, he’s either pulling weeds in his backyard or working at his other profession in the medical field as a Physical Therapist. Daniel is the author of the fun and humorous series, Case Files from Icarus Investigation, which follows the escapades of two new, unique private investigators and their team as they travel the globe to solve any case put before them. You can connect with Daniel at his website http://www.danielganninger.com to join the newsletter, or on Facebook at http://www.facebook.com/danielganninger. Feel free to pop over to his blog of rather useless and fascinating facts at www.knowledgestew.com to learn stuff to fill your brain. A new and sophisticated organized crime syndicate is determined to spread chaos around the globe… The Icarus investigation crew must stop them before it’s too late.